The state of Madison Metro bus stops may not garner the kind of media attention that a $30 million price tag for a new storage facility does, nor might a nicely endowed bus stop cost even half as much as one new off-street parking stall—let alone a few yards of asphalted street—but bus stop conditions can attract or turn off potential riders. Bus stops speak volumes to what a community really thinks of its transit system, how it prioritizes transit in its budget, how it allots Tax Incremental Financing funds and how it makes land use decisions. Is the stop a mere post in the ground where people must wait for the bus by standing in the wind, rain, snow and dark? Or can they wait by sitting in a sheltered, lighted, even heat-controlled area? Does the stop have schedule information that tells riders when their bus is coming? Using Madison Metro bus lines in the winter can be challenging. Days are short; dark comes early; it is cold, icy and slippery. But using the bus can offer some advantages over driving in winter: there’s no need to de-ice a car, or risk damage and injury trying to drive on a slick, corrosive, or rough road. 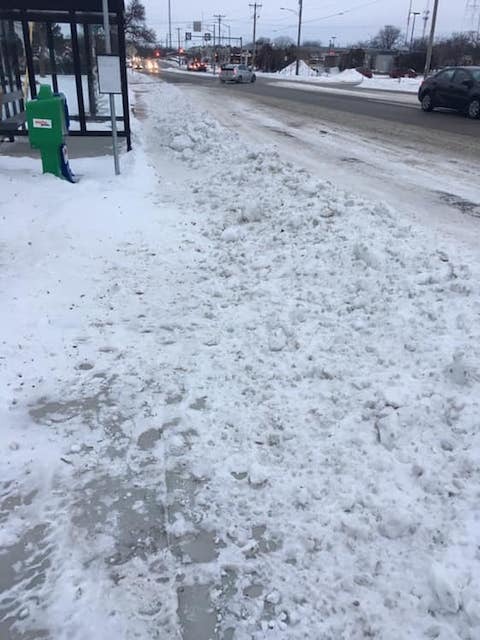 Riding the bus in winter eliminates the worry that your car might not start, get stuck in a snowbank, or worst of all, that you may run afoul of those infamous 'alternate side parking’ rules. 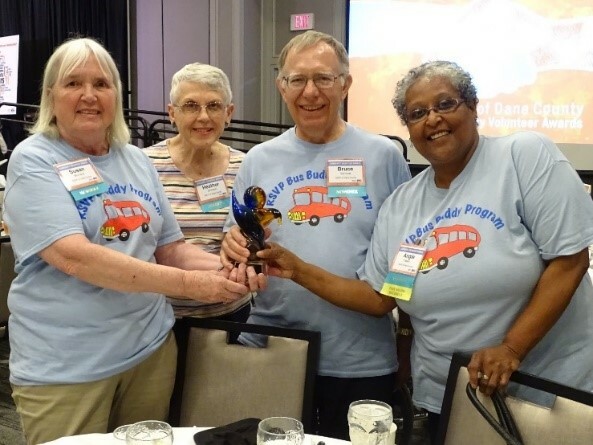 And of course, for many riders, using the bus in winter isn’t merely a convenient choice—many riders rely on the bus as their primary means of transportation year-round, or use the bus as a backup to traveling by foot or on bike as the weather gets cold. Mireles is the first Latino to hold the position of Madison’s poet laureate, a position he has held since January of 2016. As of July 1, 2018, Madison has revived at least two aspects of its public transportation system that it had between 1968 and the early 1990s, which is both good and bad. The good is that the city once more has a functioning Department of Transportation with a director. The bad is that citizen participation is being overly limited at a time when alders need more, not less, input from constituents. Let's begin with a little bit of history. The City of Madison established a transportation department (MDOT) back in 1968. Madison and Dane County were deluged by record-breaking rainfall in late August which resulted in flooding that caused damage estimated at more than $150 million, including hundreds of totaled vehicles. Since then, many residents have been forced to replace their cars. According to the NOAA National Centers for Environmental Information, Wisconsin has seen an increase in the frequency and severity of heavy rainfall events, a trend that is expected to continue in the coming decades. The trend toward heavier rainfall is driven in part by increased concentrations of greenhouse gases in the atmosphere, to which transportation emissions are a major contributor. Yet, for Madisonians replacing flood-totaled vehicles, emissions-reducing considerations like fuel efficiency and fuel type (electric, hybrid, etc.) are often of minor concern. One of the pleasant features of public transit is that it can provide riders a sense of community even as each passenger may be going to a different destination for a different reason. Some talk while others acknowledge another’s presence with a nod, eye contact or some other form of nonverbal communication. The poem, Express Route Madison, written by Catherine Young reinforces the communal nature of public transit. “This bus is bound for Community. It’s around the next bend. 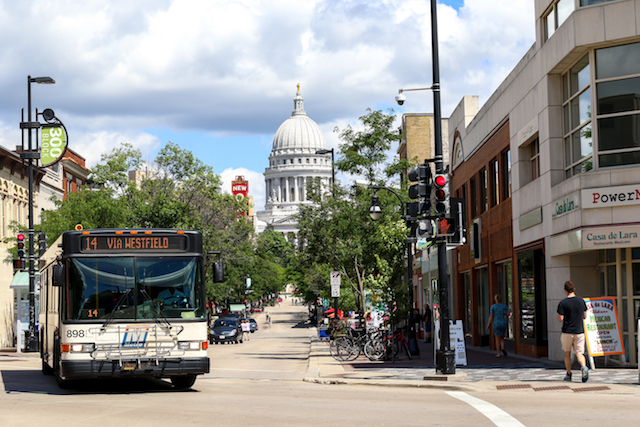 The City of Madison’s Metro Transit agency launched an online survey on September 28 asking passengers to report on equity in their bus service. According to the Metro Transit web page, the survey was launched to “reflect the goals and values” of Madison’s Racial and Social Justice Initiative. The survey asks passengers to report how frequently they use Metro Transit services, which routes and transfers they use most, and more questions about each individual’s personal profile and how accessible Madison’s bus services are to them. Madison’s bus services were at the center of a racial equity complaint in January when the Wisconsin Department of Transportation closed two DMV locations on Madison’s west side and opened a new DMV office that is more difficult to access by public transit. 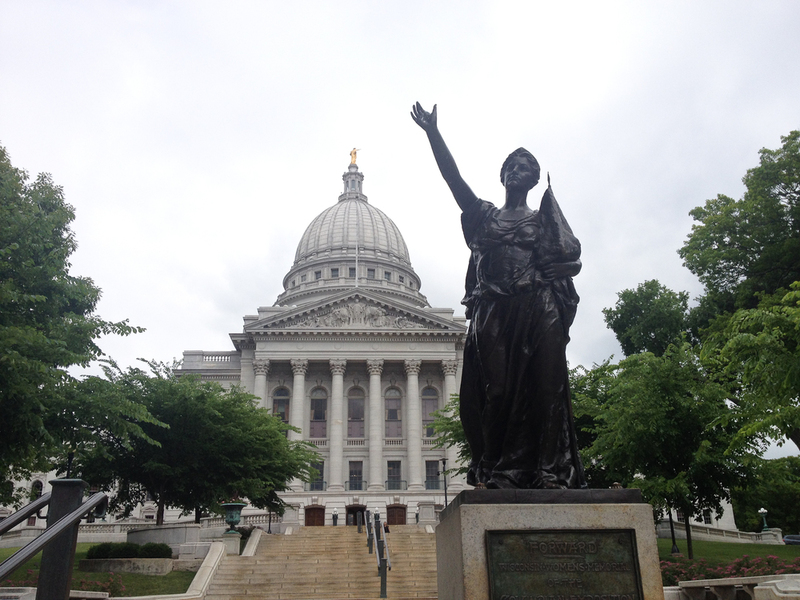 In response, Madison’s Department of Civil Rights filed a complaint with the U.S. Department of Transportation, with Mayor Paul Soglin rebuking the decision to open the more isolated DMV office. New technology provides access and challenges to Madison’s bus system that must be adopted if Metro Transit is to be a viable transportation option moving forward. A major reason ride share companies such as Lyft are popular is that they made early use of smartphone technology, which enables riders to solicit a ride from/to anywhere at any time and pay via a credit card or similar cashless electronic transfer. Public transit has the competitive advantage however, IF it used smartphone technology as adeptly. After all, most people would prefer to pay $2 instead of $10 for the same ride. Before the era of smartphones, transit riders had been pining for years for Metro Transit smart cards. FreeWheel Bikes was founded in 2003 by a group of local cyclists who wanted to establish an affordable community workshop space and promote cycling. In the 15 years that it has existed, the non-profit has given away more than 10,000 bikes. “Half of these are locally and the other half are through our work with international organizations that ship bikes to developing countries,” said Elijah McCloskey, president of FreeWheel. McCloskey, 30, said the goal of the organization is to ensure transportation as a fundamental human right, to reduce waste and increase education. The non-profit does this through giving away over 1,200 bikes a year, diverting over 35 tons of waste a year and teaching free classes to over 800 students a year.